«My Sweet Lord» es el primer sencillo del disco triple de George Harrison All Things Must Pass. Escrita en alabanza al dios hindú Krishna, la canción llegó al puesto número uno tanto en Estados Unidos como en Inglaterra. En el 2004, la revista Rolling Stone la colocó en el puesto 454 en su lista "Las 500 mejores canciones de todos los tiempos". Y como no seré yo el que juzgue, prefiero compartir con vosotros la canción originaria de la denuncia. ¿Qué os parece? A New York company , Bright Tunes, sued George Harrison for musical plagiarism. 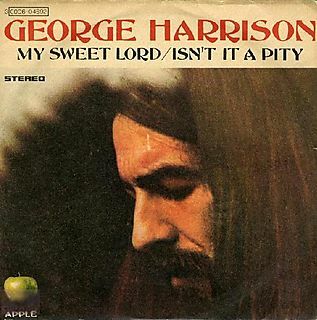 During the judgment, the musical experts tried to make clear that the melody of " My Sweet Lord " was very similar to that of " He's So Die ", composed by Ronald Mack and thrown in 1962 by The Chiffons. Finally Harrison was fined by " unconscious plagiarism " potentially provoked by a case of criptomnesia. (I did not also know what it was ..) And since I will not be I the one that judges, I prefer sharing with you the original song of the denunciation. What does seem to you?